In this class you begin more formalised training, whether you have come from our Puppy pre-school class, or are joining us for the first time. We generally take in any dog over the age of approximately 5 months into this class (although we may take smaller, more fearful dogs into pre-school for a while if we think this is appropriate). If you have trained your dog to a higher level already, we will discuss your dogs abilities and choose an alternative class if this is appropriate. 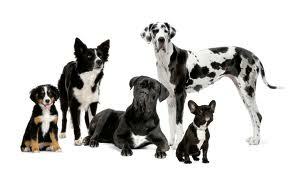 Most people who enrol in this class tend to join as they have a slightly older dog with specific training issues. For this reason we like to be able to meet you before you enrol to talk about your dog and any issues so we can be sure that we are offering the right class. Dogs who are fearful, reactive or wildly excited often need a different approach and may need an observational place on the stage so we can offer strategies to help prior to joining the main class. In the Beginners class (onwards) we teach Clicker Training. This is a modern, reward based, highly effective style of training which encourages your dog to use his brain and be a partner in your training. It’s not just using treats to get results –its all about working in a style where your dog actually learns and understands what you want.